Noree Chamber Soloists is a NYC-based collective of musicians that presents both a chamber music and solo repertoire, ranging from early music to commissioned scores. Our Mission: 1. 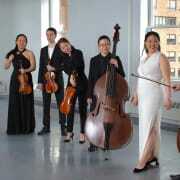 To bring chamber music performances of the highest caliber to the widest audiences possible. 2. To promote a keen appreciation and understanding of the rich history of chamber music literature. 3. To discover, arrange, and commission new works of chamber music. 4. To support the classical music community by fostering the creation of new and exciting performance outlets for working artists. Their performance praised as "musicality of a high order " and "exquisite sensitivity" by New York Concert Review, Noree Chamber Soloists is a NYC-based collective of musicians that presents both a chamber music and solo repertoire, ranging from early music to commissioned scores. The roster artists are graduates of the top conservatories, including the Juilliard School, Manhattan School of Music, Curtis Institute of Music, and Yale School of Music, and have participated in many prestigious festivals including Marlboro, Music@Menlo, Verbier, and the Perlman Music Program. As a young ensemble, Noree Chamber Soloists is committed to developing the next generation of audiences. Would you recommend NOREE CHAMBER SOLOISTS?